Dice are one of the oldest and simplest gaming devices, having been used by humans, in various forms, for millenia. But for a gaming piece of such apparent simplicity, there are a large number, and wide variety of, games that can be played with dice. 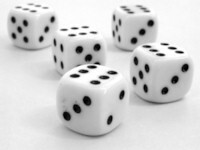 Although dice are often used as an element to interject "chance" into a game, not all dice games are purely random. Many have significant strategic elements, and mathematical acumen and computational skill can also be important talents when playing dice games. There are both traditional dice games and commercial dice games (often based on traditional rules). If you're interested in still more dice games, check out the collection of Dice Game Rule Books, featuring authoritative rules for hundreds of dice games. Learn easy, entertaining games that you can play anywhere! Start playing and discover why they are the essence of cool. This personal web site covers "everything you could want to know" about dice games (especially "Craps"). A list of games that use dice, usually with rules for the games, from the free online encyclopedia.